Build relationships and build your business. For the real estate professional, Client Relationship Management (CRM) is how you manage your interactions with three key client types – prospects, current clients and past clients. 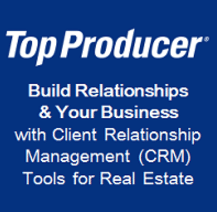 Top Producer® CRM is designed specifically to help you capture and convert prospects, guide current clients to closing and maximize repeat and referral business to turn more consumers into lifelong clients. For more information, visit topproducer.com.